National borders are so arbitrary, and yet we stage the biggest sporting events in the world (among other things) based on them. International hockey tournaments with NHL talent have always been played on tilted ice, with Canada winning three of the five Olympics in which players from the senior circuit have partaken. The US has closed the gap on Canada recently, but with Russia still developing talent using Soviet-era training methods and Finland, Sweden and others not quite having the depth to match the North American nations due to their smaller populations, it doesn’t seem that parity is near. It would be more intriguing to play a tournament with the people that celebrate New Years’ simultaneously with you. That’s right—forget national allegiances. 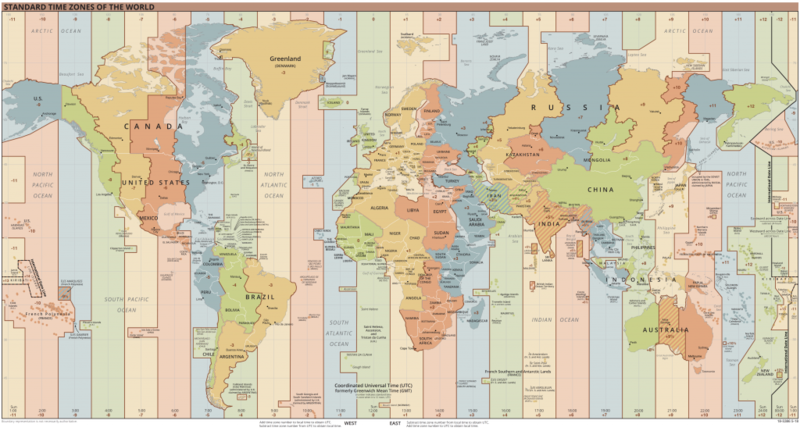 On hockey’s biggest stage (soon—trust me), the sport’s foremost superstars will be suiting up for teams like “Coordinated Universal Time (acronym UTC—no idea how) negative six.” If you weren’t always friendly with middle school geography, here’s a map of the time zones. We start out in the west with the folks that get to wake up hungover at 10 on Sundays just in time for NFL football. And I’d say we have a good-looking team on our hands here, starting with the three young star forwards on the first line. Auston Matthews grew up in Phoenix, but was actually born in the Bay Area, and Matthew Tkachuk was born in Scottsdale while his father Keith was playing for the Phoenix Coyotes, fortunately for the -7s. Beyond those two, this team is made up of primarily British Columbians with big Vancouver and Victoria presences. All four lines on the -7 squad are more than capable of providing offense, and players such as Jamie Benn and Ryan Johansen will be counted on to bring a physical presence. The Rielly-Weber first pairing on defense is arguably the best in this whole tournament, but the D-men beyond those two are underwhelming compared to the forwards. The Price-Jones goaltending tandem is excellent, and comes with a great storyline to boot. Price grew up in the minuscule town of Anahim Lake, BC—his mother being the former chief of the Ulkatcho First Nation—and he played organized hockey as a child 200 miles away in Williams Lake. Famously, his father bought a plane to make the trip to practices and games easier, and Montreal Canadiens fans will be forever grateful. This team is not the best we’ll see on paper, but they cannot be overlooked. While the bottom four D-men aren’t world beaters, they hopefully won’t have to be given the speed and skill in the forwards, and the -7s will probably play some thrilling, free-wheeling hockey. They’re not my pick to win it all, but could very well medal if Price is on his game. But what about all the other great time zone-based teams? I will be breaking down the whole world of hockey over the next few weeks, so make sure to visit the Georgetown Voice every few days. Next on the list is UTC -6 (Alberta, Saskatchewan, US Mountain Time). Who will be placed on this team? How good will they be? Stay tuned to find out.